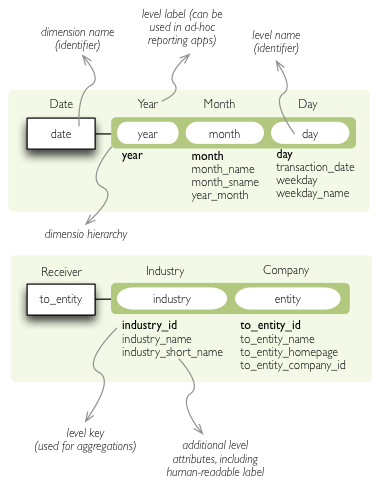 Example database schemas and their respective models. Reference of model classes and fucntions. country > region > county > town . Analysts or report writers do not have to know where name of an organisation or category is stored, nor he does not have to care whether customer data is stored in single table or spread across multiple tables (customer, customer types, ...). They just ask for customer.name or category.code . In addition to abstraction over physical model, localization abstraction is included. When working in multi-lingual environment, only one version of report/query has to be written, locales can be switched as desired. If requesting “contract type name”, analyst just writes constract_type.name and Cubes framework takes care about appropriate localisation of the value. Mapping from logical model to physical data. The logical model describes dimensions geography in which default hierarchy has two levels: country and region . Each level can have more attributes, such as code, name, population... In our example report we are interested only in geographical names, that is: country.name and region.name . The logical model is described using model metadata dictionary . The content is description of logical objects, physical storage and other additional information. public_dimensions – list of dimension names that will be exported from the model as public and might be shared by cubes from other models. By default, all model’s dimensions are considered public. 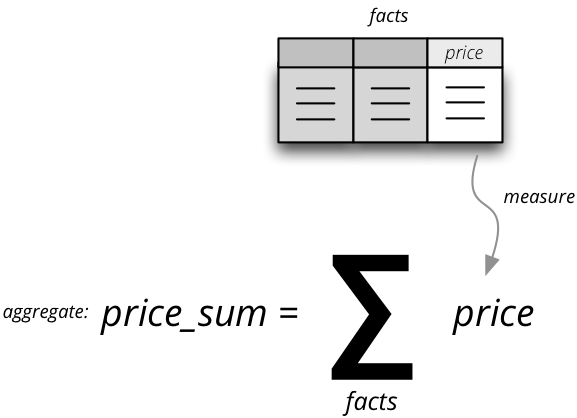 store – name of the datastore where model’s cubes are stored. Default is default. See Analytical Workspace for more information. mappings - backend-specific logical to physical mapping dictionary. This dictionary is inherited by every cube in the model. joins - backend-specific join specification (used for example in the SQL backend). It should be a list of dictionaries. This list is inherited by the cubes in the model. browser_options – options passed to the browser. The options are merged with options in the cubes. "description": "Contracts of public procurement winners in Slovakia"
One can specify shared mappings and joins on the model-level. Those mappings and joins are inherited by all the cubes in the model. 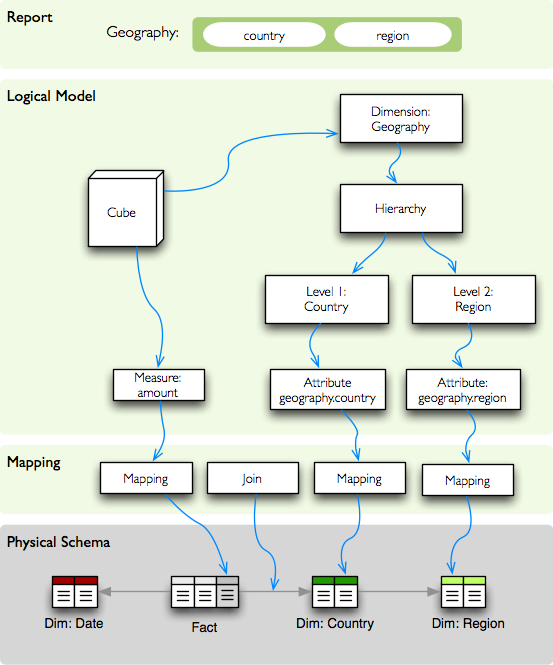 The mappigns dictionary of a cube is merged with model’s global mapping dictionary. Cube’s values overwrite the model’s values. The joins can be considered as named templates. They should contain name property that will be referenced by a cube. Vsibility: The joins and mappings are local to a single model. They are not shared within the workspace. Cubes in a model will inherint mappings and joins from the model. The mappings are merged in a way that cube’s mappings replace existing model’s mappings with the same name. Joins are concatenated or merged by their name. The model’s joins are searched for a template with given name and then cube completes (or even replaces) the join information. 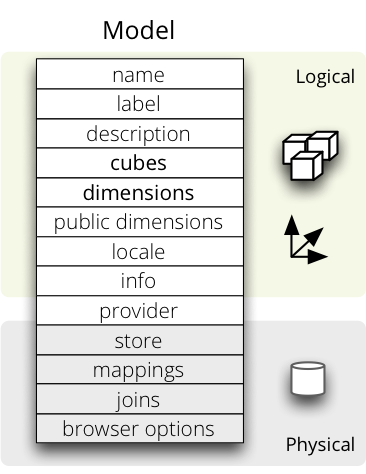 The list of dimensions and cubes in the model.json are merged with the dimensions and cubes in the separate files. Avoid duplicate definitions. If the model is provided from an external source, such as an API or a database, then name of the provider should be specified in provider. The provider receives the model’s metadata and the model’s data store (if the provider so desires). Then the provider generates all the cubes and the dimensions. The cubes and dimensions in the generated model are just informative for the model provider. The provider can yield different set of cubes and dimensions as specified in the metadata. Load a model from a file or a URL. Create model from a dictionary. All dimensions from a static (file) model are shared in the workspace by default. That means that the dimensions can be reused freely among cubes from different models. One can define a master model with dimensions only and no cubes. Then define one model per cube category, datamart or any other categorization. The models can share the master model dimensions. To expose only certain dimensions from a model specify a list of dimension names in the public_dimensions model property. Only dimensions from the list can be shared by other cubes in the workspace. Some backends, such as Mixpanel, don’t share dimensions at all. info custom info, such as formatting. Not used by cubes framework. aggregates – list of aggregate functions that are provided for this measure. This property is for generating default aggregates automatically. It is highly recommended to list the aggregates explicitly and avoid using this property. Note the last aggregate item_count – it counts number of the facts within a cell. No measure required as a source for the aggregate. If there is a list of aggregates already specified in the cube explicitly, both lists are merged together. To prevent automated creation of default aggregates from measures, there is an advanced cube option implicit_aggergates. Set this property to False if you want to keep only explicit list of aggregates. Some aggregates do not have to be computed from measures. They might be already provided by the data store as computed aggregate values (for example Mixpanel’s total ). In this case the measure and function serves only for the backend or for informational purposes. Consult the backend documentation for more information about the aggregates and measures. Create cube from a description dictionary. Dimension descriptions are stored in model dictionary under the key dimensions. Use either hierarchies or hierarchy, using both results in an error. All properties from the template dimension will be copied to the new dimension. Properties can be redefined in the new dimension. In that case, the old value is discarded. You might change levels, hierarchies or default hierarchy. There is no way how to add or drop a level from the template, all new levels have to be specified again if they are different than in the original template dimension. However, you might want to just redefine hierarchies to omit unnecessary levels. In mappings name of the new dimension should be used. The template dimension was used only to create the new dimension and the connection between the new dimension and the template is lost. In our example above, if cube uses the creation_date and closing_date dimensions and any mappings would be necessary, then they should be for those two dimensions, not for the date dimension. attributes list of other additional attributes that are related to the level. The attributes are not being used for aggregations, they provide additional useful information. key key field of the level (customer number for customer level, region code for region level, year-month for month level). key will be used as a grouping field for aggregations. Key should be unique within level. Create a dimension object from a description dictionary. Create level object from a description dictionary. Dimension level attributes can be specified either as rich metadata or just simply as strings. If only string is specified, then all attribute metadata will have default values, label will be equal to the attribute name. The optional order is used in aggregation browsing and reporting. If specified, then all queries will have results sorted by this field in specified direction. Level hierarchy is used to order ordered attributes. Only one ordered attribute should be specified per dimension level, otherwise the behavior is unpredictable. This natural (or default) order can be later overridden in reports by explicitly specified another ordering direction or attribute. Explicit order takes precedence before natural order. group name is localized, but group code is not. Also you can see that the result will always be sorted by group name alphabetical in ascending order. In reports you do not specify locale for each localized attribute, you specify locale for whole report or browsing session. Report queries remain the same for all languages.